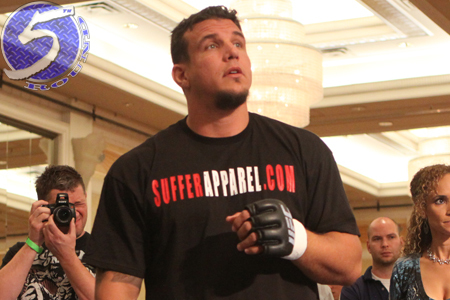 On Friday, Nevada State Athletic Commission executive director Keith Kizer reported to Pro MMA Radio host Larry Pepe that Frank Mir (Pictured) received a Therapeutic Use Exemption for Testosterone Replacement Therapy (TRT) for last Saturday’s title fight against UFC heavyweight champ Junior dos Santos. Mir now joins the likes of fellow Octagon stars Dan Henderson, Chael Sonnen and Quinton “Rampage” Jackson as users of the controversial treatment. Nate Marquardt, who has also been prescribed TRT, was fired from the UFC when his high testosterone levels knocked him out of last June’s bout against Rick Story just minutes before weigh-ins. However, that wasn’t the case for Mir. The 33-year-old not only passed April’s random screening, but also his post-fight drug exam for UFC 146. Ironically, Mir replaced Alistair Overeem in Saturday’s main event after “The Demolition Man” registered a Testosterone/Epitestosterone (T/E) ratio of 14:1, which is more than double the legal limit permitted by Nevada’s governing body. Overeem is not on TRT, but allegedly unknowingly injected himself with testosterone under doctor’s orders.